Saving water is easy, and learning how to save water is even easier with all the resources available online. If you are ready to start conserving, either for the sake of the environment or your monthly water bill, the bathroom is a great place to start making water conscious decisions. The largest water usage occurs in bathrooms and can account for more than half of all the water your household uses, according to the Environmental Protection Agency. By replacing just one showerhead with a WaterSense labeled model, the EPA estimates the average family can save 2,900 gallons of water, the amount of electricity needed to power its home for 13 days, and more than $70 in energy and water costs every year. Easy to install, aerators screw under the bottom of your faucet to reduce the water flow without reducing the pressure. Faucets with aerators can use as little as 0.5 gallons of water per minute, while typical faucets without aerators use 2.5 to 7 gallons per minute. An efficient faucet using 0.5 gallons per minute will cost you 80 cents per month, while a standard faucet using 2.5 gallons per minute can cost you $3.99 per month. Tacoma Water customers can visit the permit counter at the main Tacoma Public Utilities administrative building at 3628 S. 35th St. to get efficient showerheads, aerators, shower timers and leak detector dye tablets for your toilets – all free of charge. We can also perform a free, home-water walk through to generate a customized list of efficiency suggestions for your home. Taking a shower uses much less water than filling up a bathtub. 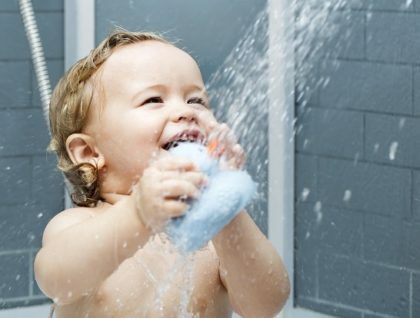 A five to 10-minute shower uses 10 to 25 gallons, while a bath takes up to 70 gallons! If you do take a bath, be sure to plug the drain right away and adjust the temperature as you fill the tub. Keep your shower under five minutes long. The average shower is about eight minutes. By shortening that to five minutes, you can reduce the amount of water that you use by nearly one-third, or roughly 10 gallons per day! Tacoma Water customers can pick up a free shower timer at our main administration building. Most people wait a minute or two for the shower to heat up before getting in. Put a bucket in the shower to capture that water and use that to water your household plants. There is no need to keep the water running while brushing your teeth. Just wet your brush and fill a glass for rinsing your mouth out when you are done. Instead of leaving the tap running while you shave, fill the sink with a few inches of warm water then rinse your shaver in the water. High-efficiency toilets use 1.28 gallons of water or less per flush, while older models use between 3.5 and 7 gallons per flush. The average household could save up to 2,400 gallons per month by replacing an older toilet with a newer, efficient model. When shopping, look for the WaterSense label to pick the most efficient and most functional models. A silent toilet leak, often caused by a flapper that does not completely close, can waste 50 to 500 gallons of water per day. A silent toilet leak that wastes 250 gallons of water per day would cost a City of Tacoma resident more than $50 per month in water and sewer charges. For more information on how to check for leaky toilets, click here. Avoid using the toilet as a trash can. Every time you flush the toilet, five to seven gallons of water is used (older toilets). Low flow toilets typically use 1 – 2 gallons/flush. Flapper valves can rust or break quite quickly causing unnecessary leakage. It’s recommended that you replace them once a year even if they are good for longer.